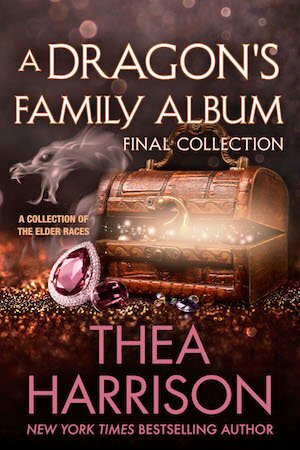 From New York Times and USA Today bestselling author Thea Harrison… comes seven pre-released stories bundled into one convenient package. This digital collection contains Dragos Takes a Holiday, Pia Saves the Day, Peanut Goes to School, Dragos Goes to Washington, Pia Does Hollywood, Liam Takes Manhattan, and Planet Dragos, all previously published separately. Dragos Takes a Holiday: When the Cuelebre family heads to Bermuda for some much needed R&R, it’s no ordinary weekend in the sun. Between Pirates, treasure hunting, and a baby dragon… what could possibly go wrong? Pia Saves the Day: The Cuelebres have moved to upstate New York. Their idyllic situation is shattered when Dragos is injured and stripped of his memory. What can convince Dragos to rein in his darkest side? Peanut Goes to School: Dragos Cuelebre is no longer the only dragon. Liam has already grown to the size of a large five-year-old boy, and his parents enroll him in first grade. But school has a surprising number of pitfalls, and Liam is fast becoming one of the most dangerous creatures in all of the Elder Races. Dragos Goes to Washington: Dragos Cuelebre, Lord of the Wyr, needs to throw a party without maiming anyone. That isn’t exactly as easy as it might sound. With Dragos’s mating instinct riding close to the surface, his temper is more volatile than ever and the threat of violence hovers in the air. Pia Does Hollywood: Pia Cuelebre heads to Hollywood to spend a week with the Light Fae Queen, Tatiana for diplomatic reasons. But when an ancient enemy launches an assault against the Light Fae, Dragos and Pia must intercede. The destruction threatens to strike a mortal blow against all of the magically gifted, both human and Elder Race alike. Liam Takes Manhattan: Reeling from a deep loss, the magical prince of the Wyr, Dragos and Pia’s son Liam Cuelebre, turns inward and withdrawn as he struggles to come to terms with who he is, along with the challenges that lie before him. A visit from a mysterious person who gives Liam hope and a vision of his future. Planet Dragos: A Vegas vacation seems the perfect opportunity for Pia and Dragos to relax and reconnect. But Death walks in Las Vegas, and Pia is kidnapped. On Planet Dragos everything goes the way he arranges it—unless someone decides to cross him, and God help them then, because he doesn’t know how to back down, and he doesn’t ever, ever let up….